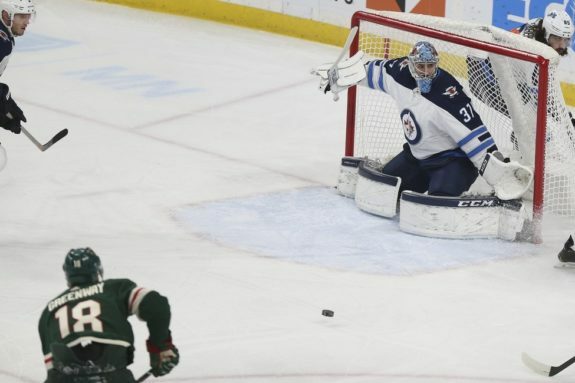 ST. PAUL, Minn. — Jason Zucker scored twice, giving Minnesota’s lagging power play a lift with his first goal and getting one later just after leaving the penalty box, and the Wild hung on to beat the Winnipeg Jets 3-2 on Thursday night. The Jets managed just one shot on goal over the first 15-plus minutes of the game, and the Wild actually had a lead to match the effort. Defenceman Jared Spurgeon hustled to keep a loose puck in possession in the offensive zone and sent it along the wall to Staal, who fed Greenway from behind the net . This was only the 15th time in 43 games the Wild have scored first. They’re 9-5-1 in those instances. The Wild had only one power-play goal in their previous 23 opportunities, all without defenceman Matt Dumba, who’s still second among NHL blue-liners this season with 12 goals and ruptured the pectoralis muscle near his right shoulder on Dec. 15. The Wild won at home for the first time in five tries since Dec. 13. … The Jets were scoreless in four power plays. The Wild have killed 15 of their last 16 penalties at home. … Scheifele tied Patrik Laine for the team lead with his 24th goal. … Wild centre Eric Fehr missed his second straight game with an undisclosed injury. … Spurgeon had two assists, his third multi-point performance in five games this month. … Jets defenceman Dustin Byfuglien, one of two Minnesota natives on the team, missed his fifth straight game with a lower-body injury that will likely keep him out until after the All-Star break. The post Wild Survive Jets – Zucker Gets Two appeared first on The Hockey Writers.